Cut to just above your boot, the First Lite Mountain Athlete Crew sock is midweight and made with comfortable Merino wool, featuring a durable nylon/spandex on the outside. The arch-lock support and no-seamed toe will keep your feet smiling for days at a time. These socks are great, I’ve used them several times on 30-40 degree duck hunts and even if they get damp they still feel warm. I have a list of rules in life to live by and one of them includes “Always buy good shoes and socks”. If you take care of your feet they will take care of you, thereby I do consider myself a bit of a sock connoisseur. These socks are snug fitting and super comfortable, with great padding under the foot and very breathable. They have quickly become my go to everyday casual sock when you need something a little more than a thin cotton sock. I also ordered the “Cold Weather” version as well but have yet had the opportunity to try them out. If they are half as good as these are my feet will thank me during those upcoming long cold days in the deer stand. Wore these hunting in the mountains of Colorado this fall. They worked ok. I would prefer a little more substance in the higher friction areas. The outsides of my big toes were feeling it by the end of the day. Did not have that issue with my other socks. Otherwise, a good product. I bought these socks before a diy archery elk hunt in 2017, I have never owned a better sock. The fit stayed true all week and were extremely comfortable. Paired with high quality boots my feet have never felt better while hiking the backcountry. Light and comfortable like wearing a cloud that hugs your feet. I hope they are as durable as my triads which have lasted years. These are cool enough for summer hiking and great spring and fall, I don't know how warm they'll be in winter but I'll be testing them out. Fits perfectly. Super comfortable and appears to be very durable as well. I tend to have very sweaty feet and after hours of hiking through the hot humid Alaska summer my feet were the only thing still dry. I bought 3 pairs to have and haven't regretted it. I wear them on early season elk hunts and they are perfect. I ordered these specifically for my hiking trip to Isle Royale. The entire trip would be hiked with a 44 lb. pack on my back. The socks not only fit perfectly, were comfortable, but they also held up and I never experienced a single blister. Because of their solid quality and that that they didn't hold scent (love that Merino wool! ), I wil also be using them for my early bowhunting season! My new favorite socks! Comfortable, fast drying, my feet always run hot and these socks seem to keep the swamp foot down to a minimal, I’m ordering 4 more pairs now. I love these socks. They are my new favorite. Hold shape well, don’t stretch out and don’t stink. Plus they never seem to bunch down at all. Really impressed. Also, for a quality sock, the price is good. I absolutely love these socks. I purchased them for a 2 week bow hunt for elk in Colorado and I will be purchasing more. The material is awesome and they are very comfortable. I would highly recommend these and I will be buying more myself. Tried these out for the first time today in my hiking boots. Put on several miles over mixed terrain, rocks, roots & dirt then stood around and fished for a few hours. My feet never got sweaty or sore. These were some of the most comfortable socks I have ever worn. Never had to stop to pull them up either. I would definitely recommend these socks. The L/XL fit my size 11s great. These socks have just the right amount of padding for a mid season hike, or for those boots that need just a little extra to feel form fitting through a long walk in the woods. I'm a guy with big calf muscles and unfortunately the tops don't fit quite right without tearing elastic. I know I'm not in the norm, especially for mountain hunting types so I'll give that one a bit of a pass since hiking socks are hard for me to find. I wore them out last week for a hike, and they had the padding and loft to be comfortable all day. The fact that the tops didn't quite fit to my calf muscle didn't bother me at all -- but I won't be replacing my Columbia socks with these as much as I'd like to. The top of the sock does not fit my 15" lower calf muscle, but few do. Upon initially putting the socks on I was blown away, they're so soft and comfortable. I have an issue with my feet sweating a lot and usually have to change my socks multiple times a day to not develop blisters and hot spots. Not with these, I can wear one pair all day and they don't even smell like feet at the end of the day. I can now eliminate at least half of the socks I would pack for my trips. They are a true mid weight sock, very comfortable. I paired these up with some Crispi Idaho GTX and I don't have a single complaint. I wear these for multiple days of hiking and they never smell. Doesn't matter if your feet stink, these are literally the only socks I own that never smell funky. I hang these up after I rest my feet for the night and you could never tell I wore them for a whole day. Had these for two years now and are still soft and strong. 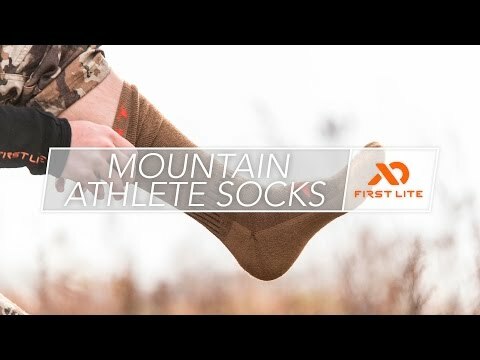 I hope though that first lite is able to make a aerowool sock. These are still hot in west Texas. These socks are amazing. The fit and feel is great and does not create any rubbing or hot spots like lesser quality socks will. The quality of the wool is by far better than Smartwool socks and seems to hold up great with multi day use without washing, there is no smell either. These feel so comfortable I find myself wearing them around the house and not just for hunting/hiking. After wearing these socks for a few months I've concluded that these are the go to socks for me. The design is simply superb. Padding is in all the right places, they breathe well and after a 4 day hunt my feet didn't stink. I wear these with everything to my hunting boots to my Chuck Taylor's. First Lite nailed it with these. I wear these socks nearly every day for work (Natural Resources). I generally am able to wear them for the entire work week (4-5 days) with minimal smell! Also, nothing beats putting on a fresh pair! Have been awesome for all hunting from early warm season through late season here in the Northwest. These socks are great. They offer some ventilation on the tops and extra padding underfoot and around your heel and shin; basically, there's padding where you want it, and breathe-ability everywhere else. Some thought went into these bad boys. Well done, First Lite! These are my everyday sock for fall, spring and winter. These socks Feel awesome and they don't stink. I am impressed by these great products, keep it up!! I've owned a pair of these socks for a year now. I've worn them in the winter while hunting and skiing or just out on the town during cold nights. These socks keep my feet warm and comfy. I have also worn these in the summer time while scouting and hiking in the mountains, and they have kept my feet comfortable without them getting all sweaty. The best part about these socks? They keep the odor under control don't have to wash them after every outing. I plan on ordering more for my upcoming elk hunt! Prior to this last elk hunting season, I was able to buy myself a full suit of first lite wool. I had smart wool socks before buying these mountain crews, so this would be a sock dual to the death on the proving grounds of elk country. To my amazement, and maybe its just me, but the socks did have stench after a day of hiking, vs the smart wools which went for days before even a hint. Both had awesome performance in the field, but for some reason these first lites had a stink to them which didn't happen with any other of the first lite gear, and i bought 2 pairs of these. Love these socks. Great for all purpose socks that will keep your feet comfortable and dry whether you are wearing waders in a stream or boots in the woods. I have found these socks to be very comfortable in the fit. I have large calves and often socks don't fit me well there or will fall down very frequently and I have found this to not be the case with these socks. Equally as important as the fit I have found that these socks don't stink after a long day of working in the heat.